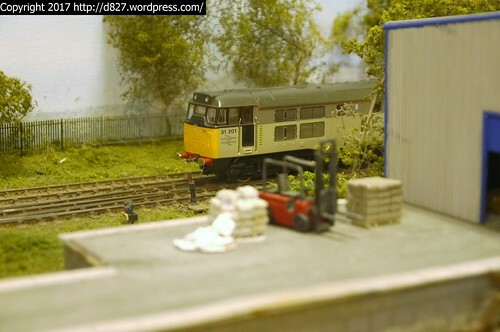 The Scalefour Society AGM moves around the country each year, with the North London Group hosting it this year with a small show. DEMU were invited to the show and so Natalie and myself set off to set up the stand on what proved to be a very hot day. The show was fairly quiet as these sorts of things invariably are. But the layouts on show were good and worth seeign (especially Bodmin). Conversions like these are very simple, especially with the Branchlines wheels (as compared to the Gibson wheels I had for the 47 from the EM Gauge Society stores). Pulling off the gear from the OO axle and putting on to the new axle is all that is really required, and a wheel gauge to check the wheels lined up (with the Gibson wheels being seperate axles and wheels this is much more important), etc. Natalie and myself took a number of photos, with plenty of access to the various layouts kindly given for photographing bits people usually don’t see much of. As usual photos are on flickr:. Waiting for the train… Take 2.